The Pacific War was decided largely by aircraft. One of the first acts of the Pacific War was the surprise attack by carrier aircraft on Pearl Harbor, while the final decisive acts were the nuclear attacks by B-29 Superfortresses on Hiroshima and Nagasaki. The former was possible only because aircraft carriers, which are essentially floating airfields, were able to get close enough to Oahu to launch strike aircraft; the latter attacks were possible because the seizure of the Mariana Islands gave the United States airfields within bombing range of Japan. Much of the strategy of the war revolved around control of airfields in strategic locations. The decisive Guadalcanal campaign was fought for control of Henderson Field. The U.S. Navy raised units called Acorns to rapidly develop advanced airfields or rehabilitate captured enemy airfields. Combat aircraft required well-developed airfields for four reasons. Runways. Combat aircraft landed at speeds in excess of fifty miles per hour. Takeoff speeds were even higher. This required a minimum of a few hundred feet of level ground in the direction of the prevailing wind with good traction and a surface that could bear prolonged heavy traffic. Such surfaces rarely occur naturally. The ideal was for a runway to be constructed of concrete, but this was a time-consuming process. The Japanese on Guadalcanal attempted to build a runway out of laterite and gravel laid directly on a grassy field, and were working around the clock by the time the Allies invaded. The Allies made extensive use of Marston mat to quickly lay down new runways. Marston mat could be used on almost any kind of level surface except swamp, but it was best laid on 12 to 18 inches (30 to 45 cm) of crushed coral. American highway engineers believed that asphalt was unsuitable for tropical areas, but the aviation engineers on Saipan used it anyway, shipping in drums of hardened asphalt and improvising a melting plant from an abandoned sugar boiler. Production peaked at 700 tons of liquid asphalt, which was used to surface a coral base. Whatever material was used, the runway was subject to cratering by enemy bombs, and materials and equipment needed to be on hand to quickly repair such damage. Where the prevailing wind was variable with the season of the year, or was unreliable, it was necessary to lay out multiple runways at angles to each other to ensure that at least one runway was directed into the wind. In 1927, the rule of thumb was just under 10 acres (4 hectares) of land were required to base each bomber. U.S. Air Force regulations in 1941 called for an airfield to have an area 1000’ (305 m) wide (with a 300’ or 90 m paved strip) and 3000’ to 5000’ (900 to 1500 m) long. Later it was found that 100’ (30 m) paved width was adequate but that the length needed to be up to 7000’ (2000 m) long. By 1943, the Seabees began construction of a new jungle airfield by clearing and grading an area of 250' by 3500' (76m by 1070m), covering an area of 100' by 2500' (30m by 760m) with crushed coral, and laying down a 75' by 2500' (23m by 760m) runway with Marston mat. This was just adequate for fighters. The runway would then be expanded as opportunity permitted to the 300' by 5000' (90m by 1500m) area required for heavy bombers. A grass strip was a hastily improvised runway constructed by cutting down the vegetation and filling in depressions. Grass strips were adequate only for occasional use by very light aircraft or as emergency strips for heavier aircraft. They had the advantage that they were difficult for the enemy to spot from the air. Logistics. Combat aircraft had high logistical requirements. A single sortie consumed from a few tens to a few hundreds of gallons of high-octane aviation fuel. Sustained flight operations thus required extensive fuel dumps and fuel delivery systems. In addition, bunkers were required for ammunition and living facilities were required for aircrew. Fuel tank farms were a superb target. As a result, aviation gasoline was best stored in underground tanks or, if this was not possible, in dispersed and heavily camouflaged surface tanks. Fuel in barrels was easily dispersed and camouflaged, but refueling aircraft from barrels was a time-consuming process. An Allied airfield typically required unloading facilities capable of handling 1000 tons per day. Defense. However deadly they may be in the air, aircraft are sitting ducks on the ground. In addition to radar to direct its own fighters, an airfield required the protection of antiaircraft guns and needed hardened shelters for grounded aircraft, fuel dumps, munitions bunkers, and personnel. Equipment needed to be on hand to repair damage to runways and other vital equipment as quickly as possible. The usual shelter for an aircraft was a hardstand surrounded on three sides by revetments, which were walls of earth intended to protect the aircraft from strafing and bomb fragments. Ideally, these shelters were widely separated and provided with some concealment. More sophisticated shelters providing a measure of overhead protection were rarely feasible, except at major bases such as Hickam Field on Oahu. As the Allies gained control of the air, the Japanese made greater use of deception at their airfields. Aircraft were widely dispersed and heavily camouflaged, and American pilots who struck Heito airfield on Formosa on 9 January 1945 reported that most of the aircraft there appeared to be dummy aircraft. However, such deception put the aircraft so far from the runways that it took considerable time to bring the aircraft from their camoflaged revetments to the runways and prepare them for takeoff. The Americans had a definite edge in runway repair following bomb damage. A Marston mat runway could be completely repaired in about 40 minutes, while Allied intelligence estimated that Japanese repair crews took about three hours to make inadequate repairs at their forward air bases. Part of the difference was the availability of construction machinery: A carry-all could move as much earth as 180 service troops. Maintenance. Aircraft require frequent maintenance, and this is best carried out as close to the front line as possible. Maintenance requires stores of spare parts and skilled mechanics. While minor repairs could take place outdoors, more substantial repairs required overhead pulleys for lifting large parts, and these pulleys were usually mounted in a repair hangar. When the Allies began their counteroffensive, surviving Japanese pilots were able to escape from occupied or isolated islands, but their skilled maintenance crews were usually left behind. As a result, quality of Japanese aircraft maintenance dropped steadily. In a pinch, an airfield could do with improvised versions of any of these features. 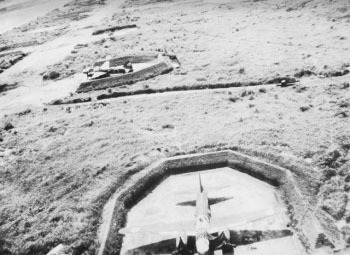 However, airfields lacking adequate runways could not support large or numerous aircraft, particularly in bad weather; lack of logistical support reduced the number of sorties that could be flown; lack of defenses made an airfield vulnerable to attack; and lack of maintenance facilities meant that badly damaged aircraft could not be repaired, while less damaged aircraft or those in need of routine maintenance had to be flown back to a rear-area base. The Japanese, in particular, were so short of skilled mechanics that damaged aircraft in the South Pacific were often abandoned, while other repairs and maintenance required that the aircraft be flown as far back as Formosa, where there was a major aircraft maintenance facility.